MFORMA Group, Inc. and leading global entertainment licensing company Marvel Enterprises, Inc. signed a licensing agreement that will bring Marvel's catalog of world famous entertainment brands to mobile phone users throughout the world. This landmark agreement was announced today by Daniel Kranzler, MFORMA CEO, and Tim Rothwell and Bruno Maglione, presidents, respectively, of Marvel Worldwide Consumer Products and Marvel International. The agreement calls for MFORMA to publish an extensive portfolio of mobile entertainment products based on many of Marvel's iconic characters as they appear in movies, television, video games and comic books which will be available in all domestic and international territories, except for Japan. As part of the agreement, MFORMA will co-publish selected Marvel-based mobile games with Activision, one of the world's leading video game publishers. Activision brings a rich heritage of developing, publishing, and marketing blockbuster video games based on popular brands, including Marvel's major properties. The MFORMA/Marvel multi-year global product plan identifies mobile entertainment applications of every kind and represents one of the most far-reaching publishing programs seen in the mobile industry. "Nothing like this has ever before been done in mobile," said Daniel Kranzler, MFORMA CEO. "Today, the market and mobile technology has matured to the point that a deal of this magnitude is possible. We have spent the last year expanding and building our global distribution and production capabilities so that we can serve the needs of an entertainment powerhouse like Marvel. Marvel brands routinely turn gold at the box office and in console gaming and they will do the same in mobile around the world-in Europe, North and South America, and most of Asia. We are pleased beyond words to be working with Marvel and Activision on this fantastic and perfectly-timed opportunity to catapult mobile entertainment to mainstream status all over the world." Marvel's instantly recognizable characters represent one of the world's most powerful brand franchises. The Marvel/MFORMA relationship will bring the entire universe of classic Marvel characters (with the exception of The Punisher family of characters) to hundreds of millions of mobile phone users worldwide. 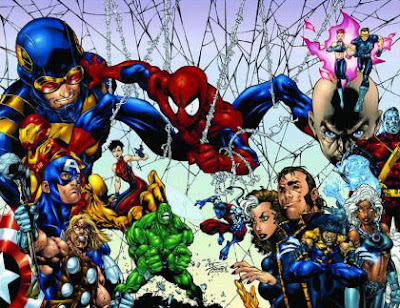 This includes such world renowned heroes as Spider-Man , X-Men , Fantastic Four , Incredible Hulk , Captain America , Daredevil , Iron Man , Blade , Ghost Rider , Elektra and many more of Marvel's more than 5,000 characters. The MFORMA/Marvel product lineup runs the full gamut of mobile entertainment products, including action, adventure, RPG and trading card games, images, screensavers, graphics, ring tones, voice tones, mobile greeting cards, mobile comic books, phone functions, virtual character simulations, and community and lifestyle applications. In addition to distributing the new Marvel content through MFORMA's global network of more than 100 wireless operators in 39 countries, MFORMA will create and host Marvel Mobile, a branded wireless and online website featuring informational, promotional and transactional links to all Marvel Mobile content. Marvel Mobile will have its home on the Internet within www.marvel.com. Subscribers to the Marvel Mobile channel will have access to all Marvel Mobile products, plus unique community applications and features, special collectible items, Marvel news alerts and chat rooms, fan clubs and mobile commerce options that will open up access to all of the activity taking place in the Marvel Universe. "Mobile is a major new entertainment medium and our objective all along has been to enter this new space on a grand scale with an ambitious partner capable of putting together a holistic program across the various developing technologies and applications in the wireless space. We believe MFORMA is capable of delivering on that objective and we are thrilled to be working with them," commented Tim Rothwell, president of Marvel Worldwide Consumer Products. Bruno Maglione, president of Marvel International added: "Wireless entertainment has been talked about for several years now, but we have really seen the industry starting to break into the mainstream in this past year and we expect that trend to continue into 2005 and beyond. Accordingly, the timing is right for Marvel to develop its presence in this medium especially as our brands synch perfectly with the most popular emerging applications and the user profile we see developing. With MFORMA as our partner, we expect success for Marvel brands in wireless just as we have achieved in the video game arena." "Marvel will be a force in mobile, just as they have been a force in every other medium they have entered," said Matt Edelman, MFORMA's SVP of publishing and architect of the deal. "Our existing Marvel-branded mobile offering based on X-Men, which was co-published with Activision, has been very successful and I see that the possibilities of what we can create and deliver based on Marvel's rich, diverse, and fascinating set of characters are endless. The built-in audience is huge and global, and we will provide something for everyone. Our plan is expansive and includes every form of mobile entertainment so we can establish each Marvel property as a mobile franchise in its own right." Activision and MFORMA will co-publish key titles based on rights Activision had previously acquired from Marvel. The two will jointly publish mobile games based on Spider-Man , X-Men , Fantastic Four and Iron Man . The agreement between MFORMA and Activision extends a pre-existing agreement and collaboration that successfully brought Marvel's X-Men to wireless last year in the form of a mobile video game based on the highly successful X-Men movie sequel, "X2" by Twentieth Century Fox. Activision's Marvel-branded video games have proven to be enormously successful, selling more than 15 million copies since 2001. "Our strategic alliance with Marvel has resulted in some of the most successful Super Hero video games ever," said Dave Anderson, senior director of business development, Activision, Inc. "The co-publishing relationship with MFORMA strengthens Activision's commitment to the super hero genre and allows us to continue developing exceptional Marvel-based games for mobile phone users worldwide." Marvel franchises will have a significant presence in the film and video game worlds well into the future, and MFORMA, Marvel and Activision will collaborate to leverage each and every important media event. The first products to be delivered under the agreement will be a suite of mobile products based on the Blade Trinity film from New Line Cinema, which is to be released in theaters on December 8, 2004. In January 2005, a second suite of products based on the movie Elektra by New Regency/Twentieth Century Fox will be introduced. In the summer, another suite of products based on the upcoming blockbuster "Fantastic Four" from Twentieth Century Fox and a corresponding video game from Activision will join the lineup. Additional titles coming in the near future include products based on Incredible Hulk, to be released in conjunction with a video game from Vivendi Universal Games, and Ultimate Spider-Man, tied into a next-generation video game from Activision. MFORMA and Marvel will collaborate on marketing programs to help promote the availability of Marvel mobile products to consumers worldwide. "Mobile entertainment has been successful thus far because it has evolved to take advantage of not only the advancing technology of mobile phones, but also the advancing interests of mobile users who are always looking for the next big thing," said Edelman. "Marvel Mobile represents the next big thing and we believe mobile users will love what they find there." Added Kranzler, "We are pleased to be Marvel's exclusive mobile publishing partner for a majority of its characters, enabling them to have their brands published around the world in all forms of mobile content. We have reached a level of global distribution capability today where it is possible to handle publishing and distribution for Marvel and other global brand holders such as Activision and leading movie studios on a truly global basis." For additional information visit the Marvel Web site at www.marvel.com and Mforma at www.mforma.com.